I'm delighted to stop by today with some recent editorial work I've done for Love Patchwork & Quilting magazine - with a English Paper Piecing theme so do read on if you're into that, and British Patchwork & Quilting, similar in title name but very different in style. In case you don't follow me on Instagram (@messyjesse1) you might have missed my announcement, that several months ago I was asked to contribute a whole booklet of English Paper Piecing projects for their January 2015 issue! Using… wait for it … diamond EPP shapes! Yayy, my favourite EPP shape of all! i should mention the issue includes a free pack of mixed paper pieces in 1", 2" and 3" sizes, so you can get making right away and if you're impatient like me that's ideal. The projects are all based on a sewing kit theme, so pincushions, needle-cases etc. Double the fun, as I love making things for my sewing room. It was such a honour to be asked, LP&Q magazine really is my top of the picks in the industry. They do such brilliant work, as I know I've mentioned here before and regularly highlight British quilters like myself so it's a win win. First up the sewing machine cover. I knew I wanted to do this design straight off the batt, so eager I was to get started on this, I realised I was making up the hexagon/star blocks in the wrong size, doh! Note the photo below - they made for some great props though! Once I got back on the right foot using the 2" size diamonds I was well underway, and after a lot of head scratchy moments I figured out a way to make it 3D to fit over a sewing machine, and not loose the continuos design. Phew! The EPP sewing kit! Again this, and all the other projects in the book came to me pretty quick. I think having a clear brief, with a set theme, colour palette and using only diamonds really helped me keep on track and I felt much more confident to come up with fun ideas, while still stretching my creativity. I absolutely loved the colour palette they suggested too, I would never think to put these colour's together but they work so well and even though they are a departure from my normal comfort zone of colour's, each piece has a distinctive Messy Jesse stamp on, I think. Oh the needle-case! I love this one so much. I'm going to have to show you this in more detail on another post as I didn't take any photo's of the real thing. This little thing folds up, and then opens out to a complete circle. I wanted to showcase those big 3" diamonds some way, and I think this needle-book was just the ticket. 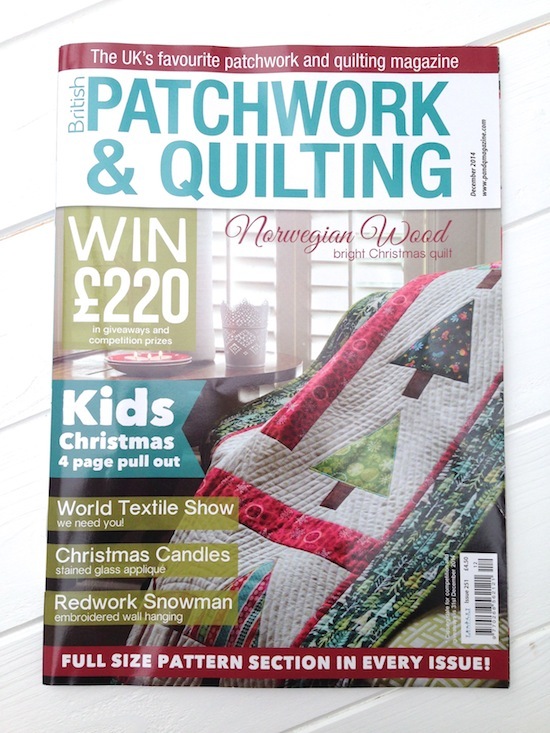 My other exciting news to share is this 'interview with a quilter' interview in British Patchwork & Quilting magazine! This is the December 2014 issue just gone, so unfortunately it won't be that easy to get a copy of anymore. I was initially contacted by Sheilah last Spring I think, after requesting some information on reproduction fabrics I stock at Sew and Quilt - for an article she was working on about vintage feedsacks. After a little email exchange an offer for an a Q&A in an upcoming issue came about, of course I said yes! So Sheilah very kindly took a 5 hour + train ride all the way down to Penzance to meet me! She was just lovely, and we hit it off straight away talking about our love of fabric and vintage feedsacks. She even gifted me a beautiful handmade rug-mug that I use in my sewing room now, and floral tea cup. And if that wasn't thoughtful enough she even sent me some feedsack scraps she had left over from her article! I'm so pleased with the article, and I'm so honoured to be featured in such a prestigious magazine. Thank you for such a great opportunity again Sheilah. What wonderful projects! And how exciting to have your beautiful work featured in two great magazines. I'm so excited for you!! Super exciting! Congrats on your publications in two magazines! Your work is so beautiful and fresh! This is so well done Jessie - beautiful items showcasing your English pp skill. Congratulations (Da-da-da-da-dat-dat..and Celebrations-Cliff Richard just jumped into my brain) but you deserve the whole song with Bells, Whistles and Balloons tied on for your big Cover Story moment, and your whole booklet. Wow, what an achievement - It could have been designed for just you, all your very favourite things EPP, diamonds? Perfect. As always your work looks immaculate, and so fresh and pretty. I absolutely Love the little needlecase and am eagerly looking forward to your future post about it (I say 'Post' but I'm hoping for 'Tutorial'...) I'm off out to buy this magazine today, and I just want to wish you the very best of luck for the future. I'm new to your blog and really enjoying it. I hope I can still find both of these magazines - I love your lovely creations! Maybe with some luck I can make one of these cute little items! Thanks for sharing with us! I've just picked up my copy and your EPP book is fantastic! I love the sewing machine cover and travel case in particular - going to try them both. Beautiful wedding ring too -congratulations! Wow great, Jessie!! This is so well deserved. Your design sense is extraordinary!